Dancers are a unique blend of artiste and athlete. They are particularly susceptible to musculoskeletal injuries and pain. The health problems of dancers are worthy of attention for several reasons. First, because most dancers begin training at a young age, there is potential for a great impact on their future health. Second, the interplay of physical and aesthetic demands in dance may lead to various health issues especially relevant to dancers. Finally, as an occupational group, dancers have received little attention in the health literature. Through this blog series, I wish to educate the dancers about the basic human anatomy and the biomechanics (mechanics of the human body) and bring about awareness regarding various issues like strengthening and stretching of various muscles, the injuries a dancer may be prone to and the possible preventive and rehabilitative measures for it. 1. Isometric contraction – A muscle contraction that produces force without a measurable change in the joint angle is considered an isometric contraction. Isometric contractions can also be referred to as static or holding contractions. 2. Isotonic contraction – An isotonic muscle contraction causes a Joint to move through some ROM. Two types of isotonic muscle contractions need to be addressed. a. A concentric contraction causes a shortening of the muscle fibers. The force generated by the muscle fibers is greater than the resistance encountered. 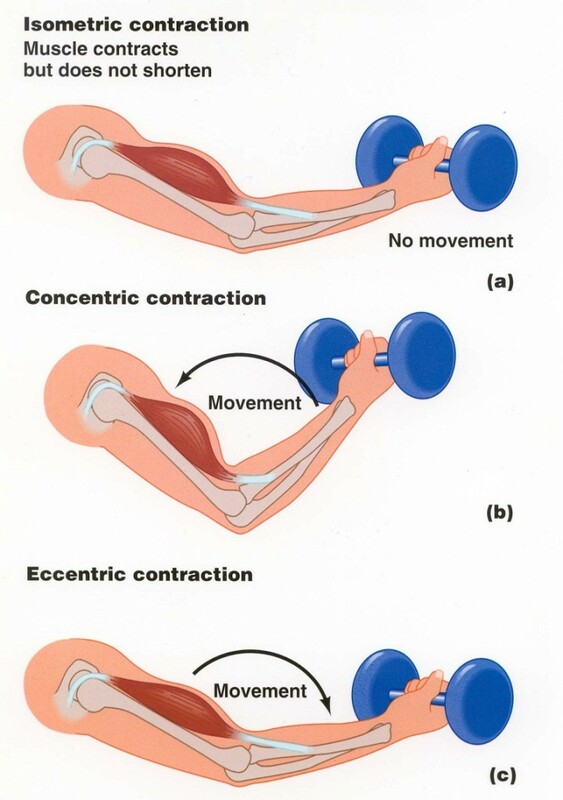 Concentric contractions produce acceleration of a body segment. One example of a concentric contraction is performing a biceps curl with light resistance throughout the entire elbow ROM. b. An eccentric contraction is produced when the resistance encountered is greater than the force produced by the muscle fibers. The muscle fibers lengthen under the resistance. Eccentric contractions produce a deceleration of a body segment as well as provide shock absorption for various activities. An example of an eccentric contraction is lowering a heavier weight in a controlled manner. 3. Isokinetic contraction – An isokinetic contraction is a muscle contraction that occurs at a constant rate of speed. Isokinetic contractions of the muscle may be performed concentrically or eccentrically. 4. 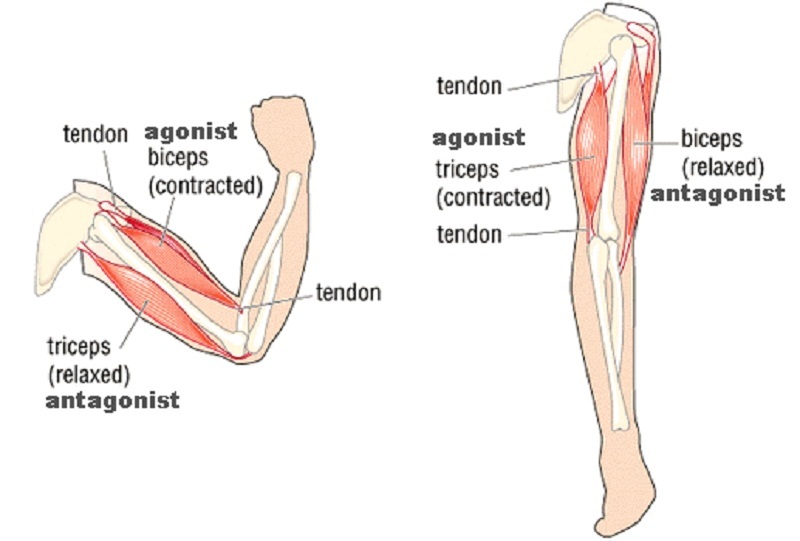 Agonist and Antagonist – The principle muscle or muscle group that produces a joint motion or maintains posture is referred to as an agonist. The agonist, or prime mover, contracts to produce an eccentric, concentric, or isometric contraction. An antagonist is a muscle or group of muscles that demonstrates the opposite anatomic action of the agonist. The antagonistic muscle passively elongates or shortens to permit motion. 5. Synergist – The action of the synergist is to contract at the same time as the agonist. The synergist contraction may be identical to the agonist, or it may prevent an unwanted action of the agonist acting isometrically. When the-agonist contracts, it has the capability to move both the distal and the proximal attachments with the force produced. The synergists automatically contract to fixate that segment at which movement is not meant to occur. 6. Passive Insufficiency – Muscles that are elongated over two or more joints simultaneously may not allow further movement of the agonist at a given point. This phenomenon is referred to as passive insufficiency. 7. Active Insufficiency – When a muscle attempts to contract with its attachments in close proximity, the force produced is weakened. This is active insufficiency. WRITING NEW CHAPTERS IN DANCE.